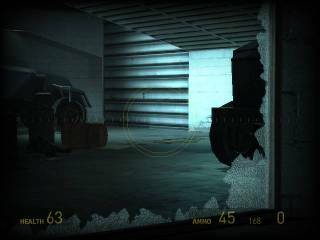 Half-Life 2 review Game Over Online - http://www.game-over.com First person shooters are big business nowadays. There's a zillion and one World War II titles on the market, a couple million science-fiction shooters, and thousands of realistic combat shooters. It wasn't always this way, though. 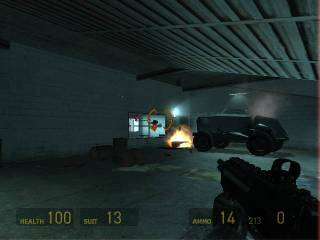 The FPS genre was built off the backs of three games: Doom, Quake, and Half-Life. Doom brought the genre to the forefront, Quake revitalized the genre with a combination of a coherent storyline and fast-paced multiplayer, and Half-Life, along with its mods Team Fortress Classic and Counter-Strike, raised the bar even higher for both single- and multi-play. Half-Life has seen a few conversions which altered the singleplayer portion of the game, but hasn't had a true sequel... until now. 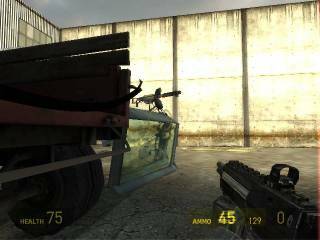 Half-Life 2 hit on the PC a while back. How did Valve's baby turn out on Microsoft's Xbox? Read on to find out. The story starts off fairly simple. You're once again playing the role of Gordan Freeman. He's a scientist, an unlikely hero, and the savior of the world. He's also been thrown into an oppressive police state. The game begins with a bizarre dream sequence, then tosses you into the lull before the storm. It gives you a chance to get acquainted with the controls and (perhaps more importantly) experience the atmosphere of the city you're in. 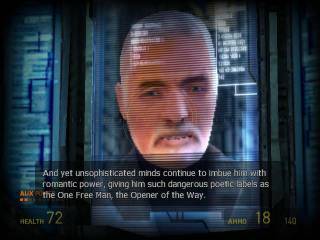 A Big Brother-esque voice appears over radios and holographic video screens, preaching propaganda throughout this portion of the game. Stormtroopers, each of which look oddly scary in their helmets, will push you out of the way if you get to close or catch them in the act of beating up a civilian. The civilians themselves are cowed and refuse to speak to you in public. 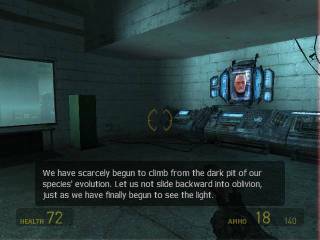 The 1984 scenario is almost cliche by this point, but Half-Life 2 pulls it off with admirable deftness. The cinemas take place in real-time, meaning that you can walk around and explore while you're being fed exposition. Characters are animated to be very close to real people, even down to their lips flapping as they speak. This results in genuine immersion, particularly when you end up on the run from the authorities armed with only your wits. It's obvious that the civilians are extremely restless. They'll risk their lives to try to help you evade the authorities. One thing that Half-Life 2 does that impressed me is easing you into the game. You don't start out with a full load of weapons (you start with exactly none), nor do you start in the middle of a battle. The "Getting to Know You" portion of the game is lengthy, but this shows off another of Half-Life 2's strengths. The voice acting and individual scenes, and through them the story, are good enough to keep you interested even when you haven't killed anything for ten minutes. 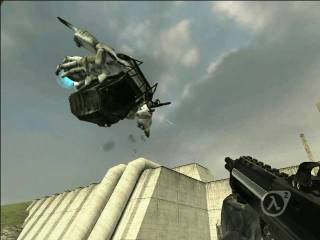 Throughout the game, the killing itself is balanced out with exploration and plot segments. All of this adds up to a very natural balance. Some games kill you with plot, or simply throw enemies at you with no rhyme or reason. 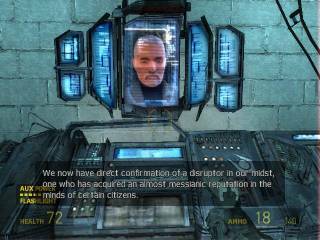 Half-Life 2 finds that perfect middle ground. That isn't to say, of course, that the enemies aren't in full effect. No, there's plenty of enemies (including a few returning ones from the original game), plenty of surprise shocks, and plenty of hectic battles. 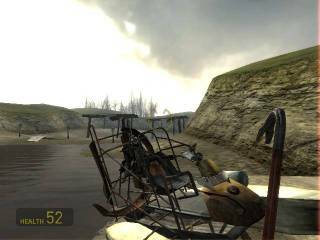 The controls use the now-standard console FPS configuration and are nicely responsive. Gordon behaves exactly how you tell him to behave, though he is awfully spry for a scientist. Weapon switching is simple. It's handled via the D-Pad, with each direction representing a different weapon. A few of the weapons have alternate fire modes. These are easily activated by the L trigger. The controls are the last thing you should be worried about, however. 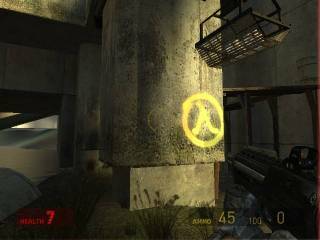 The original Half-Life was no joke when it came to difficulty and this one steps down that same path. Enemies are not shy at taking potshots at you before you notice them, or even slinging exploding barrels at you. You'll sometimes come into situations where you're facing what seems like overwhelming odds. You've got two choices in that case. You can either stand and fight, and hope that you're a good enough shot to make it through, or find a good hiding spot, assess the situation, and look for an alternate solution. The point is to kill the bad guys without getting shot, and standing out in the open firing blindly does you no good at all. 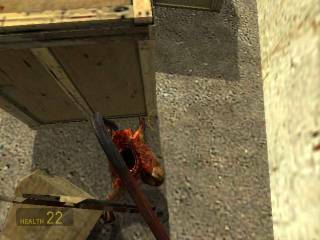 Half-Life 2 is ostensibly a science-fiction FPS, but there are a few horror elements, as well. You may not get the creeping, raw dread found in a Silent Hill title, but you'll certainly jump out of your seat once or twice, Resident Evil-style, when Gordon is suddenly ambushed by headcrabs in a vent, when a zombie leaps out from behind your supply box, or when you're running down what you thought was an empty corridor, only to be suddenly jerked into the air and into the gaping maw of a creature. Valve wants to keep your pulse pounding throughout the game and they've done a pretty thorough job. This job is helped a great deal by the scenery. Everything, from the brutal police state of the city, to the rundown tenements, to the ugly toxic sludge, to the gleaming sci-fi labs, looks beautiful. The textures are rich and sharp, bricks actually look like bricks and wood looks like wood. 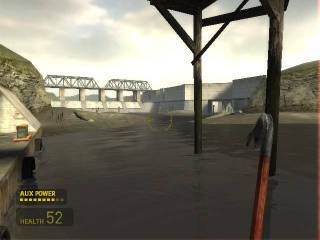 Half-Life 2 may not quite be up to Xbox 360 quality, but it shows that there's a great deal of life left in the regular old Xbox. The animations are very lifelike, and the faces on the character models are very well-detailed. There's none of that ridiculous extended hit boxes on objects business going on in this game, either. You won't get hung up on invisible edges of objects simply because they don't exist. 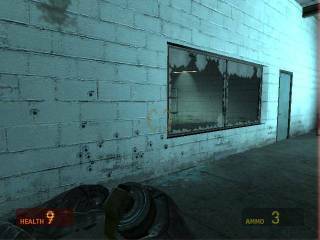 The Half-Life 2 world, even in the midst of all that's going on in the plot, is very organic. All the myriad locales fit together without breaking your suspension of disbelief. The ability to pick up most of the debris in the game and toss it around, either by hand or by gun, serves to further the already immersive experience. It's odd that you can't see your feet when you look down, however. That's a minor quibble, though. There are a couple of disappointing things about the game, though. The levels are very well-textured and thought out, but they aren't quite seamless. You'll run into loading screens every so often as the game loads the next area of the stage that you're already on. This is undoubtedly a concession to the Xbox's low RAM, and the loading times do not tend to be more than ten seconds long, but it's still aggravating. It takes you out of the game mentally to have to sit there and wait for a progress bar to fill up. There's a silver lining to every dark cloud, however, and that's Half-Life 2's checkpoint feature. It's fairly obvious-- when you die, you can restart at the last checkpoint you reached. The checkpoints are invisible, but they are numerous and also serve to confirm that you're going in the right direction. If you've wandered around for an hour and a half without seeing a new checkpoint, you've missed something. The other baffling thing is the complete lack of an online mode. There's no online multiplayer, no content download, and there's not even a Friends List function. 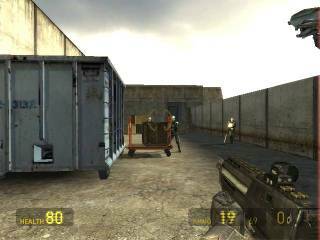 I am certain that porting Counter-strike: Source from the PC to the Xbox probably would've added months onto Half-Life 2's development cycle, but multiplayer is almost a no-brainer nowadays. It can turn a mediocre action game into the next big thing on Xbox Live. 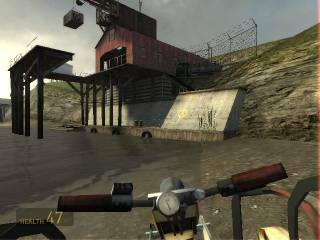 The single-player mode is strong, to be sure, but first person shooters nowadays, and on the Xbox in particular, have us trained to expect some kind of multiplayer, be it over Xbox Live or system link. First person shooters are big business nowadays. There's a zillion and one World War II titles on the market, a couple million science-fiction shooters, and thousands of realistic combat shooters. It wasn't always this way, though. 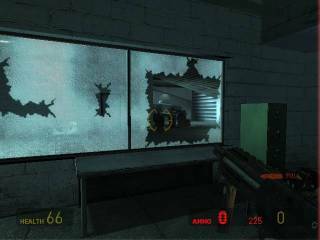 The FPS genre was built off the backs of three games: Doom, Quake, and Half-Life. Doom brought the genre to the forefront, Quake revitalized the genre with a combination of a coherent storyline and fast-paced multiplayer, and Half-Life, along with its mods Team Fortress Classic and Counter-Strike, raised the bar even higher for both single- and multi-play. 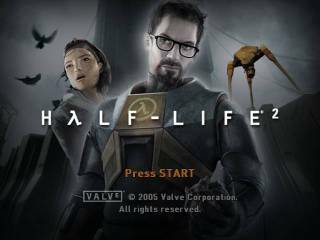 Half-Life has seen a few conversions which altered the singleplayer portion of the game, but hasn't had a true sequel... until now. 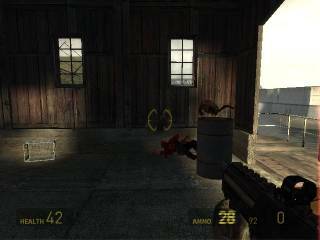 Half-Life 2 hit on the PC a while back. How did Valve's baby turn out on Microsoft's Xbox? Read on to find out. Overall, though, those are fairly minor quibbles. The annoying loading screens don't detract from the fact that Half-Life 2 has some of the best gameplay, a quality story, excellent voice acting, and extraordinary graphics. 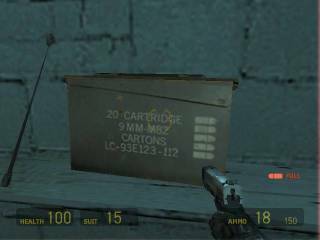 If you like first person shooters with good stories, you owe it to yourself to give Half-Life 2 a try. The river chase alone is worth the price of admission.